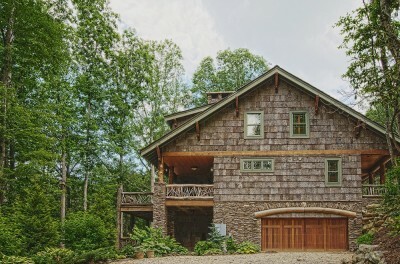 "It's impossible," is what Jim and Jo Anne Griffin heard from almost everyone when they expressed their vision for a very unique, mountain lodge. Jim, a builder and developer himself, desired to incorporate the trees on their surrounding property into the structure of their home. Everyone said this was unattainable, except Mark Kirkpatrick. Mark understood the Griffins' vision and was excited to take on the exceptional project. 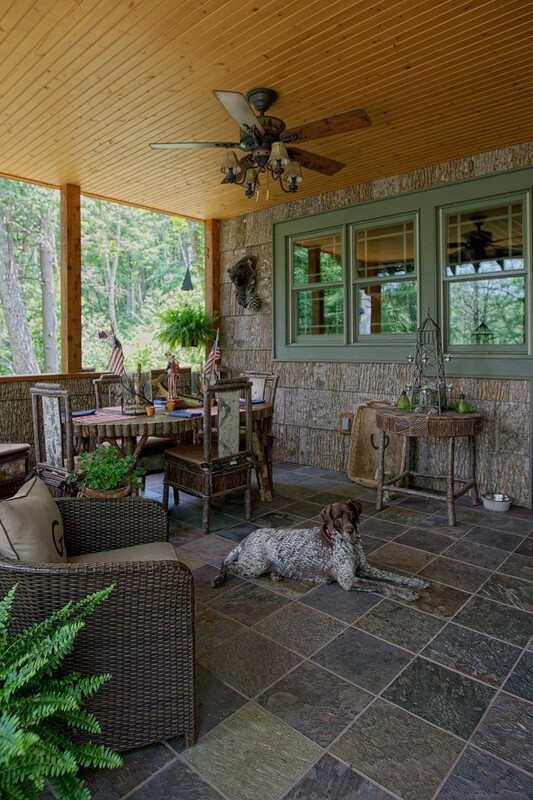 Mountain Construction, established by Mark in the mid nineteen eighties, has an incomparable ability in working with natural elements when building custom mountain homes. Experience, Creativity, Vision and Knowledge are words they run their business by, and are committed to bringing all four elements to every project they take on. 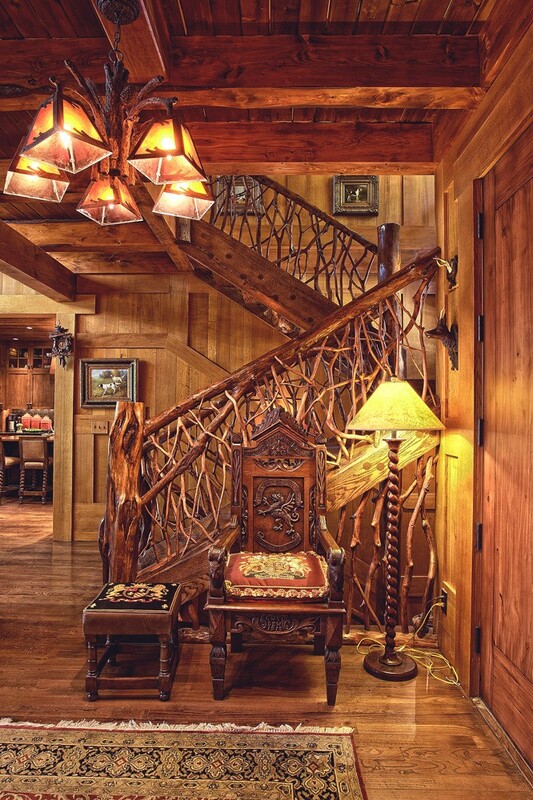 They made the impossible a reality by designing and crafting the timbers taken from the Griffins' property to create an extraordinary mountain lodge. Charlie Hart, the project manager, and expert carpenters Jeff Dunn, Darrell Taylor, Boone Stadfeldt, Bucky Black, Rick Ward, Josh Smith, Ryan Jordan and others were essential in bringing the Griffins' mountain lodge to life. Mark, along with carpenter Bucky Black, devised a list of materials for all the wood that had to be harvested from the building site. They then took on the task of literally crafting nature and incorporating it into the structure of a house, in a stylish and dignified manner. Mountain Construction considers a carpenter to be an artist, and their goal is to create art you can live in. This is apparent from the moment one steps onto the driveway of the Griffin Home. 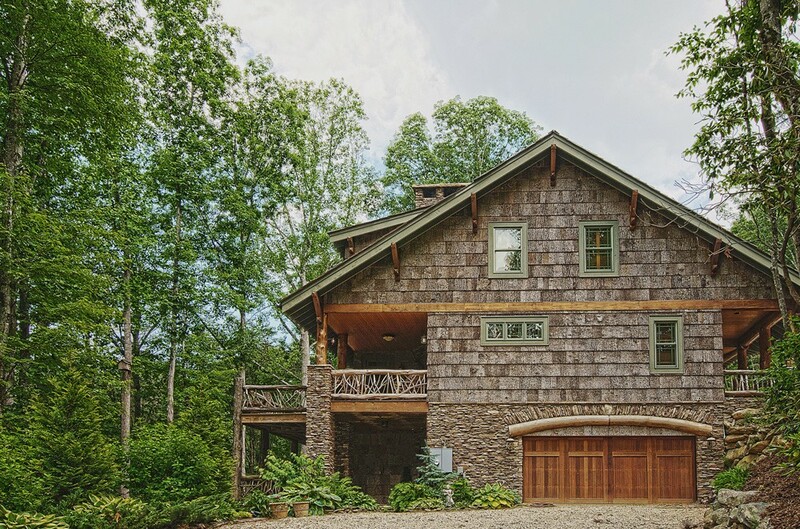 Poplar-bark shingles and natural wood accents help to create the astonishing, rustic look of this secluded mountain home. The massive eyebrow dormer, enhanced with a natural curve, graces the front entryway, supported by two substantial hemlocks. 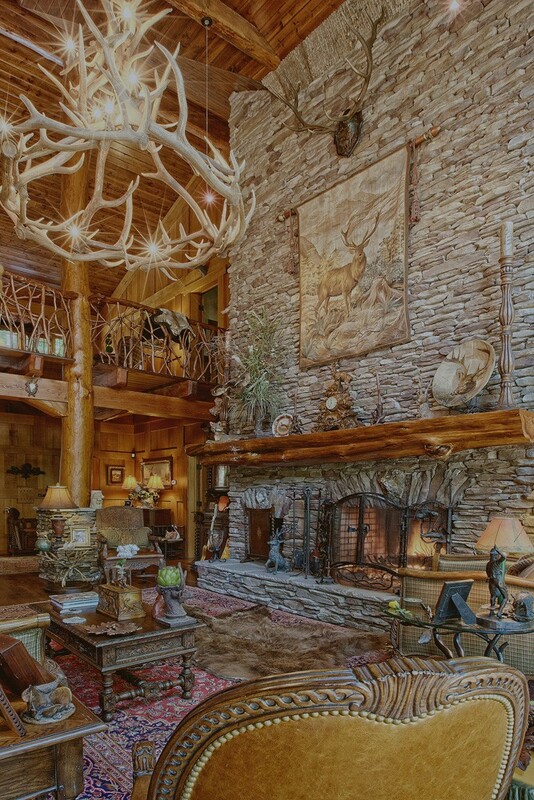 Admiration is all but required when one steps up to the striking front door, which is hand-carved with a picturesque scene of a bear catching a fish, surrounded by large pine trees and mountains. 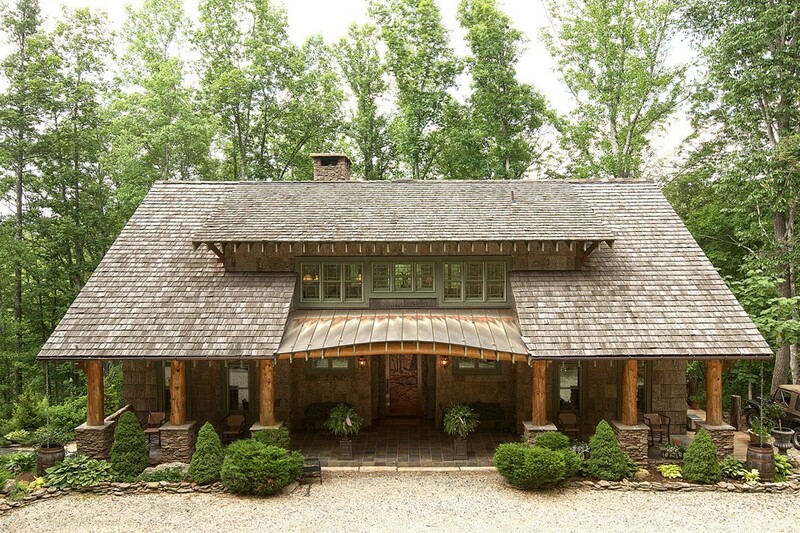 Upon entering the Griffin Home, the appealing aroma of natural wood is a pleasant greeting, and replicates the feeling of those rustic mountain lodges found in Blowing Rock and Linville from the 1900s. Almost every surface in sight was constructed of natural wood, and every door blends perfectly into the surrounding wall. The immense, hand-peeled mantle piece, adorned with colossal candlesticks, is the focal point of the spacious living room. Adding to its distinct quality, the mantle is made of a cedar log rescued from their neighbor's yard in Holden Beach after Hurricane Charley dug a destructive path. The impeccable stone fireplace, with a 50-foot chimney, provides an ideal backdrop for the room that contrasts well against the wooden walls and ceiling. 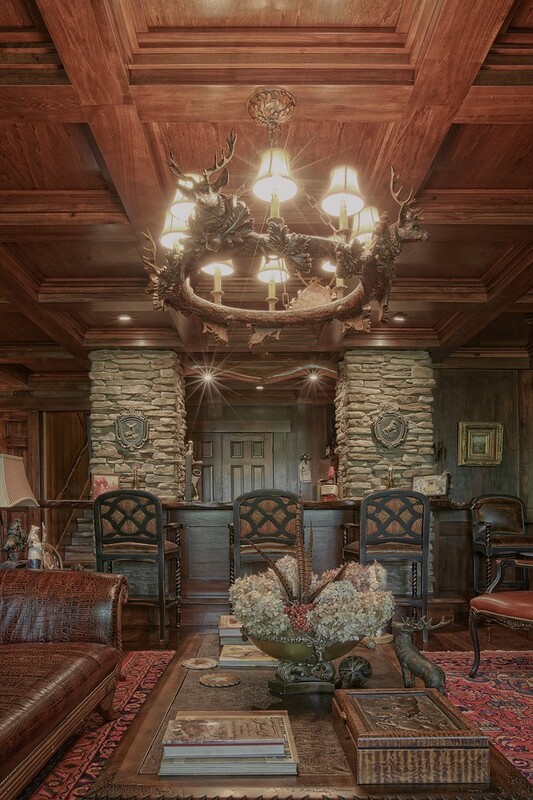 The custom-made antler chandelier hanging from the soaring paneled ceiling, along with other antlers hanging on the walls, complete the naturalistic "lodge" feel. Owners Jim and Jo Anne took responsibility for the interior design, and their vision is made clear through the classic rugs garnishing every room and the antique furnishings that were handpicked from local retailers to fit in each space flawlessly. The rustic feel continues into the adjoining kitchen, as the wormy chestnut cabinets adorned with antique German glass, a copper farmhouse sink, and dark granite backsplash give the area a captivating appeal. Jim, who enjoys being the main chef of the household, combined elegance with functionality as seen in the wooden panels covering the fridge, the hidden pull-out spice cabinet, and the pantry spacious enough to allow room for all the items needed to survive a High Country winter. The utilization of native wood is carried into the kitchen through the island, made from a slab of a maple tree with the natural edges still intact. The kitchen walks out onto a covered portion of the deck, with stone tile floors and an outdoor table ornamented with sticks and wood that seem to have been picked up from the yard only moments ago. The surrounding forest give the area a "tree house" type feel, and the space is a perfect one for an outdoor family meal during the scenic summer months. Wrapping around the house, the rest of the deck overlooks a forest of trees and mountains, and it's not hard to determine where all the unique wood in the home came from. The line of rocking chairs placed on the deck provides the perfect place to look out to the mountains and watch for a summer storm. Also neighboring the living room is the master bedroom, which Jo Anne graced with flawless attention to detail and an impeccable eye for design. Instead of the wooden quarter sawn oak paneling in the rest of the house, the master bedroom walls are enhanced with pine tongue and groove above ornate wainscoting. Jo Anne chose to paint the paneling a cream color in all the bedrooms, allowing the space to feel more open and light. In the corner of the bedroom the stone carries over from the fireplace in the living room, and provides a perfect focal point for the eye. 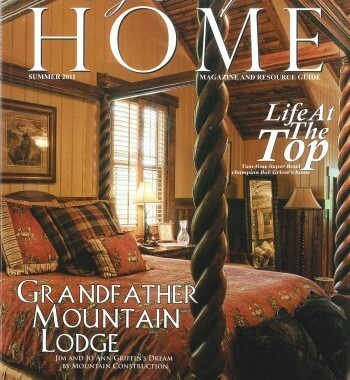 The plaid wallpaper in the master bath is a distinctive touch and coincides with the mountain lodge atmosphere. The large pedestal tub and antique vanity bring one back to the days of old, where rustic appeal meets an elegant beauty that is hard to find in the present day. The bedroom walks out onto a covered portion of the large back deck, where one can find an array of comfortable couches and a gorgeous stone fireplace, perfect for relaxing with the family on a cool evening or for a more tranquil evening for two with a glass of wine. The stairway leading up to the top level of the home employs twig railings that were constructed using the mortise and tenon, or hole and peg, approach. Each twig had its own individual hole made specifically for it to fit into, and, although very time consuming, gives this staircase a very unique appeal. The stairs themselves are also eye-catching, made of oak and retaining the natural wood line on the edge. A beautiful stained-glass acorn lamp hanging from the ceiling adds the perfect touch to this one-of-a-kind stairwell. The refined, clean-cut paneling is easier to observe from the loft, and perceiving the massive beams made from wood found on the property up close makes them that much more unbelievable. At the top of the stairs sits a comfortable study with an antique-looking dresser, surprisingly housing a hidden flat-screen TV, which rises up with the push of a button. Adjacent to the study on either side are two guest bedrooms. The first, fittingly called the "Hunter's Room," boasts painted paneled walls, refined twisted bedposts, and majestic historical furnishings. When walking into the attached full bath you may mistake it for a forest, as rustic birch bark garnishes the walls, still holding onto mushrooms and lichen from when it was a living element in the woods. The second guest bedroom includes another stately four-poster bed with a leather-upholstered headboard. An antique carriage sits to the side, paying homage to Jim and Jo Anne's new granddaughter. While all the rooms tie together in a rustic lodge type fashion, they are unique in their own way and each alludes to a different sentiment. While one can easily observe how elements throughout the house were derived from concepts found all over Europe, the lower level speaks volumes to the old English "Gentlemen's Pubs." The bar was created from one cut of wood and boasts the perfect place for friends to sit down and enjoy a drink or two. The coffered ceiling and leather-topped table create a sense of timelessness, and the classic pool table gives off an ambiance perfect for entertainment. The lower level is overflowing with dark cherry wood, centered around a sizeable wine cabinet, filled with Jim and Jo Anne's own brand of wine named Inishowen, also the name they gave to their magnificent home, after a peninsula in County Donegal, Ireland, the home of Jim's ancestors. The wine cooler cabinet, acquired from the Louisiana Purchase Restaurant, became the inspiration for the room and holds 120 bottles of their favorite wine. The collaborative relationship between builder Mark and owners Jim and Jo Anne was a very positive one, and Mark feels extremely appreciative to have had such professional and supportive home owners. 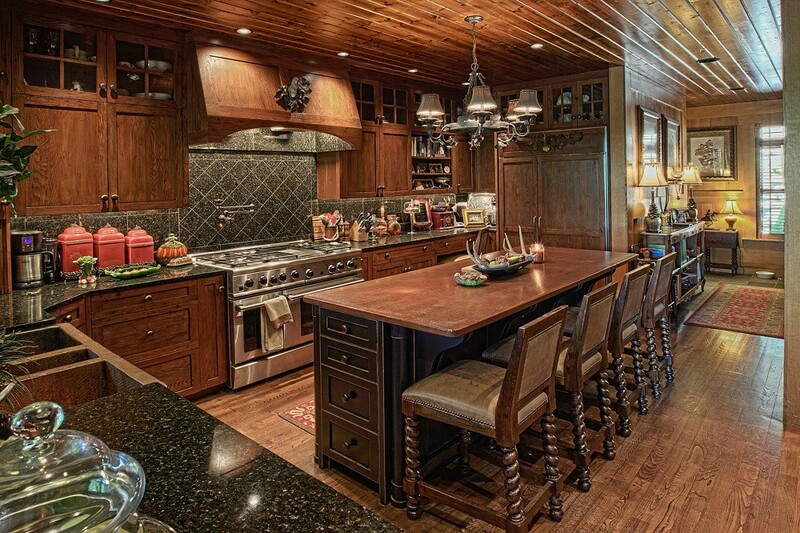 Jim and Jo Anne feel equally as grateful to have found a builder who could bring their fantasy of a rustic mountain home that utilizes natural elements from the surrounding property, to fruition. At Mountain Construction, their vision is always client-driven, as you can see from the dedication and enthusiasm that went into constructing this extreme mountain lodge. The best part of the job, as Mark describes, is stepping back after the completion and looking on with pride at what they have created together. After looking over the work he completed on this project, Mark should feel extremely proud of what he and his team have created. Jim and Jo Anne will be living in the mountain lodge of their dreams for years to come, surrounded by a forest, both indoors and out.